B is for Brother/Sister | sara, darling. i collect new music and songs much like i do new clothing: i go for long periods without buying anything, maybe picking up an odd accessory here or there, and then go on a spurt where i need new clothes, or the seasons change, and i buy a bunch of things at once. and then return a good chunk of them a few days later after buyers remorse sets in, or i see them in a normal mirror and not something specially designed to get me to buy these crazy items in the store. okay, that last part doesn’t happen with music. sometimes i find new treasures while digging for other things at a thrift store or perusing some overlooked corner of the Internet Shopping Mall. 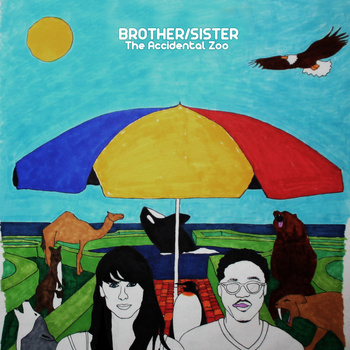 such is the case of the 3-song EP for the band Brother/Sister. interesting anecdote: Brother/Sister is, indeed, made up of a brother and a sister, Theo and Sasha Spielberg. and if that last name looks familiar, you would be right in assuming that they are the children of Steven Spielberg. like that family needs any more freaking talent. ugh, some people’s kids. reading tumblr dashboard —> read post reblogged by zooey deschanel —> post was a video chat karaoke from the site she co-founded called hellogiggles —> watched the video, which made me wonder what other ones were there —> watched a few —> which included one from a girl named sasha spielberg —> which made me remember how much i like the song she sang (brand new key, by melanie, which was nearly ruined for me by its inclusion in the movie boogie nights, which i watched against my will in high school by my then-best friend —> bought brand new key on itunes —> while it was downloading, googled “sasha spielberg” because i’m nosy mcnosystein —> found out that she’s the daughter of steven spielberg, tweets often, as does her half-sister jessica capshaw, and that she formed a band with her adopted brother, theo —> which made me listen to one of their songs on youtube, since i struck out on spotify and grooveshark —> which made me want to acquire all of the songs —> which made me search for it online, finally finding a free download from the website bandcamp.com. and now you know why i can’t get anything done during the week. but, these dreamy-three songs are now on my playlist of the week, and will imaginably in heavier rotation this fall winter. it’s (as my husband says) “totally dreamy-60’s-girlish-pop that my wife would listen to.” fair warning: that first track gets in your head, in the positively best way possible. it’s yours*, compliments of my procrastinatory internet-trolling tendencies. you’re welcome. *as always, to download, just right-click and select ‘save link as’ and follow the directions. ← A is for A Really Bad Idea, or Alphabet (take your pick). thank you for the music! also, so good catching up with you here. i’m inspired by national blog posting month. i just did an experiment for my alternative processes class that uses letters–not the alphabet letters, the kind that come in envelopes. i’ve been sleep-deprived lately, but i’m up again after going to bed at 8:00 tonight, i think because i had bad yogurt for dinner. i’m working morning shifts at the coffee shop tomorrow and saturday. i think that’s pretty much my entire update. i feel like at the end there should just be a little disclaimer, like “this has been an official heather brown update.” i like you so much.